I halved the recipes and make it into 6 -inch round cake and about eight muffin size small-cakes, below the portion used. When i first tried the cheesecake made in muffin size, it taste quite perfect. Whereas on the next day, i ate from the 6-inch cake round for a birthday party, it feels quite cloying, maybe this cake has to be quite cool to be good? For the picture above, the sour cream topping looks to be “melting” from the surrounding heat as we had move the cake around a bit while bringing it to a birthday party. 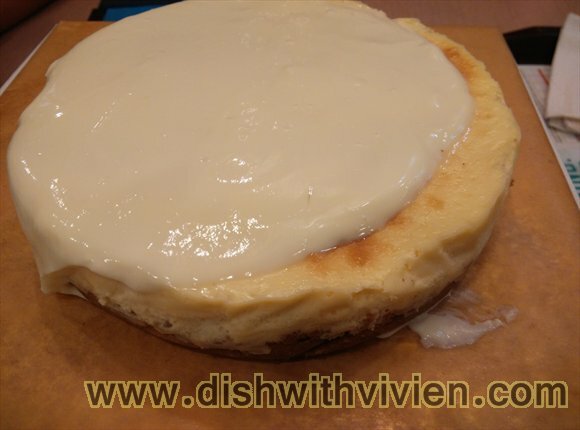 Since making this cake, i have made cheesecake using another recipe which uses lemon juice instead of sour cream, i find the lemon cheesecake taste quite good, so don’t think i will be making this sour cream version again as sour cream is quite expensive here.